It’s been a while! One of the things that’s kept me away from this blog over the last month has been travel – Erin and I spent a couple of weeks in Thailand (vegan report: amazing food everywhere, even with language barriers; didn’t see as much animal cruelty as feared (& saw animal welfare sentiments to balance it out) but didn’t go seeking it either; learned how to cook vegan thai-style fish cakes; discovered the wonders of mango sticky rice… full blog post coming soon) & I’ve had a couple of smaller trips in the last month. So I thought I’d write about the airport. Auckland Airport used to be hopeless for vegan snacks – a bag of chips from the bookshop was often your best bet. The domestic terminal still isn’t the best, but there are some options at the international terminal. 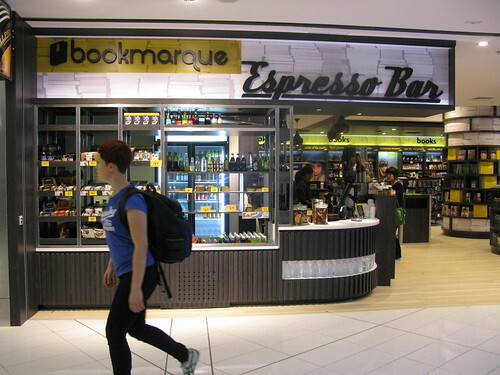 Bookmarque is a little bookshop and café on the post-security side. They serve Allpress coffee, and a range of locally-produced snacks from small New Zealand companies. Vegan options include Kokako Fairtrade organic banana bread and Bliss balls, The Original Kumara Chips, Proper Crisps, Whittaker’s chocolate and Foxton Fizz. When I flew overseas late last year, the food court on the check-in side of security was smaller than usual – some of the businesses were boarded up with signs promising big, exciting things to come. The next time I went to the airport, the new options next door to McDonalds were revealed… Subway and KFC! The third new option was a little more worthy of the hype: Silk Road is a reinvention of the sushi bar that had been in its place, and serves Southeast Asian food. The menu includes V and DF markings for vegetarian and dairy free options – and while it’s frustrating to see tofu dishes that aren’t vegetarian, it’s good to know before making the mistake of ordering them. 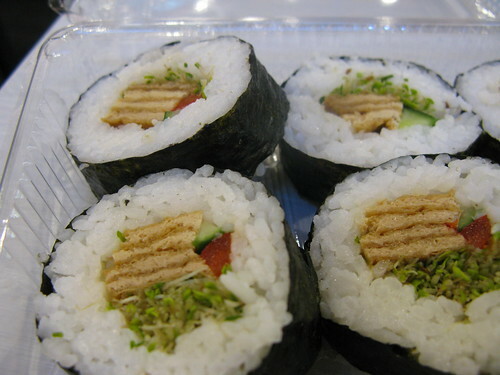 I had some pretty good vegetarian sushi from Silk Road. On the way to Thailand, we discovered another new café after security: a branch of Newmarket ‘gourmet deli’ Zarbo. Their breakfast menu included a bagel with avocado and tomato. I ordered it without butter, just to be sure, and it arrived without butter… or avocado or tomato! I sent the confused-looking waitress back for my toppings, and they arrived looking fairly pitiful – a tiny sliver of bruised-up avocado & watery tomatoes. 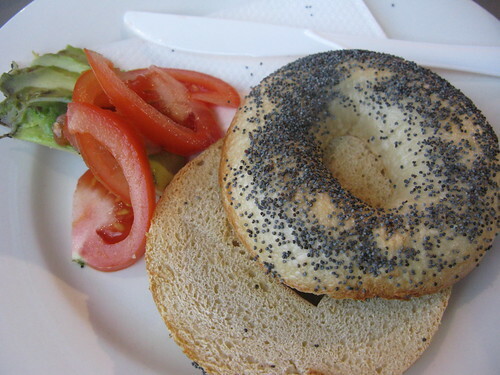 I’ve had similarly mediocre bagels-with-avocado in my time, but would have expected better from an establishment that markets itself as foodie and includes the bagel on its actual menu. The coffee was pretty bad, too. So based on this one experience, I wouldn’t particularly recommend Zarbo at the airport, but am listing it here for completeness. Also new on the post-security side is a Bennetts of Mangawhai booth. Some of their fancy handmade dark chocolates are vegan, including Almonds in Dark Chocolate and my favourite-ever take on the scorched almond genre, New Zealand Volcanic Rocks. There are still boards up in the pre-security food court with promises of more new food places to come. I’ll be interested to see if there are more vegan things to try next time I’m leaving the country.